Although snowdrops have been flowering for months, 'the season' is just getting going in its increasingly frantic way. The first event, the snowdrop sale at Myddelton House, occurred last Saturday and was apparently a great success, with the 'snow wolves' (as someone described them on Facebook) being in fine form as they ran to snap up choice morsels from the sales tables. The Daily Telegraph reports today on a nicely green-marked discovery made there on Saturday by Matt Bishop. Ebay sales are also in full flow, with Galanthus elwesii 'Kencot Ripple' currently the front-runner for the year, having sold recently for £468, causing ripples aplenty across the social media. Next weekend there will be the Alpine Garden Society's snowdrop day in Stratford and many others will occur through February. 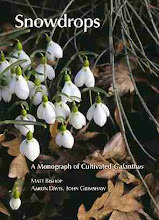 A major absence is the Galanthus Gala, but an alternative, developed to fill the gap, is the Snowdrop Study, Sale and Social day on 15 February, taking place as part of the Shaftesbury Snowdrops Festival in Dorset. As with the Gala there will be a selection of vendors selling interesting snowdrops, on this occasion including Matt Bishop, Richard and Val from Woodchippings, Joe Sharman's Monksilver Nursery and Tom Mitchell's Evolution Plants, and talks. I'm speaking on the subject of 'Primrose Warburg and her garden at South Hayes', accompanying Andy Byfield (speaking on Turkish species) and Melvyn Jope (Greek autumn-flowering snowdrops). The organisers have made it very clear that this is a social event, not just a study day, so I hope to get chance to socialise with all these friends - and many others as well. The programme and booking information is available here. Colesbourne Park will be open as usual each weekend in February and the first weekend of March (info here) - I look forward to a visit in due course. I'm also hoping to get to Austwick Hall, at the other side of North Yorkshire, where my friends Michael and Eric have created a snowdrop walk over the past several years. They are open on various days in February. I see from pictures online that the flowering season is well advanced in southern gardens, but here in North Yorkshire it is still comparatively early and the majority of my snowdrops are still some way off flowering. These are a few whose pictures I took during a lull in the rain on Saturday. It was raining and cold yesterday too, when Julia Lewis of Radio York visited to interview 'a North Yorkshire galanthophile' for her programme to be broadcast on Sunday morning - I hope I conveyed something of the charm and fascination of snowdrops. 'Clovis' - a lopsided curiosity. Sorbus pseudohupehensis in October: one of the many species of Sorbus that produce genetically identical seedlings through apomixis. My post 'Celebrating Sorbus' (8 December 2013) prompted a colleague at an American botanical garden to request some seed, so before Christmas I gathered bunches of fruits of different species to extract seed from. Gathering seed from any collection of garden plants is fraught with the risk of unwelcome hybridisation and in general such seed is not useful where accurately named material for research is needed. 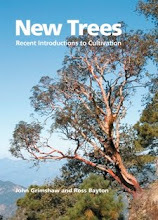 But many species of Sorbus, as with other members of the Rosaceae, produce seed by apomixis, which means that there is no fertilisation and no recombination of genes and that in consequence the seedlings are genetically identical to the parent plant - and thus safe to distribute. The fruits of each species ripen at different times and become variably softened as they do so. Some of the pink-fruited ones, like S. pseudohupensis and its relatives, remain very hard for a long time into the winter (which is why they give such a long season of interest), while many orange- or white-fruited species have softened and gone long ago. To encourage the softening process, as extracting seed from hard fruits is a very tough job, I bagged each collection in a plastic bag and left them to sweat in a warmish place (nowhere in this house being aptly described as warm). Sorbus and Cotoneaster fruits going squishy in sealed plastic bags. Today, having some spare time, I cleaned the seeds, using a very useful technique I learnt when cleaning tomato seeds long ago in Holland. The fruits are squashed firmly but gently, breaking open their skins and releasing the bulb and seeds. This is most easily done by squeezing the fruit through the bags. After this the squashy (and somewhat smelly) mess is tipped into a bowl of water and stirred round. Another rub of the fruits will wash the seeds out of the pulp. Being the densest objects in the 'soup' the seeds will sink to the bottom of the bowl and the light, floating sludge can be be gently poured off the top. The first stage of cleaning: fruit pulp in a bowl of water. This will leave a little heap of the heavier material at the bottom, with a certain amount of extraneous gubbins. Clean water is added and successive washings and stirrings, with the floating debris being carefully poured off each time, will leave almost pure clean seed in the bottom of the bowl. It's exactly the same principle as that employed in panning for gold - the heaviest particles are left at the bottom of the pan - but can be done in the comfort of the kitchen, and with the certainty of finding something useful at the end. The number of washings will vary but two or three will usually suffice. After the final wash: almost pure seed left in a little water. A final swirl of water is used to wash the seed into a sieve, from which it's tapped out onto a sheet of kitchen roll. There will be a few impurities left, but these are most easily removed once the seed is dry by the usual blowing and vibrating techniques used to purify a seed sample. I'm giving the seed I'm keeping a couple of weeks in the fridge before I sow it: most Sorbus seed needs a long cool period for best germination, so this will at least help them along the way. Almost pure Sorbus seed knocked out of a sieve onto kitchen roll. The Silver Sebrights came to 'help' weed. The morning started fine and bright so I got myself into the garden fairly promptly and was able to do some useful tasks before the weather soured into a wet and windy afternoon.The second bin of compost is now spread as mulch on the main border, and I got a good dose of weeds out of the bulb borders where the snowdrops (especially) are pushing up thick and fast. Perhaps most importantly I strengthened the defences against rabbits, whose incursions have become rather excessive recently. It doesn't help that I have a very personable doe in residence, who clearly attracts her share of suitors... These pictures were all taken with the iPad. The current crop of flowers on Muscari 'Autumn Glory', which throws up a series of inflorescences between autumn into spring. A couple of decent Cyclamen hederifolium plants intertwine. The critical section of the main border mulched and tidied - outside my study window. Lollop shares the pheasants' aviary, currently with a nest of very wild babies. The young Lady Amherst's Pheasants tucking into a bundle of weeds: they love Galium aparine! Hellebore seeds (from Bobby Ward) germinating: an optimistic start to the year. At some point in the early hours of this morning, the stat counter registered the 300,000th visit to this blog. Although I write it primarily for my own amusement and as a record of what I'm doing (it is a very handy aide memoire, often used), it's good to know that so many people have visited and find some value in it. From kind comments delivered verbally and on here I know that it's not just my mother coming back repeatedly: thank you all for your interest, and may I wish you a happy and enjoyable 2014 in your gardens and beyond.